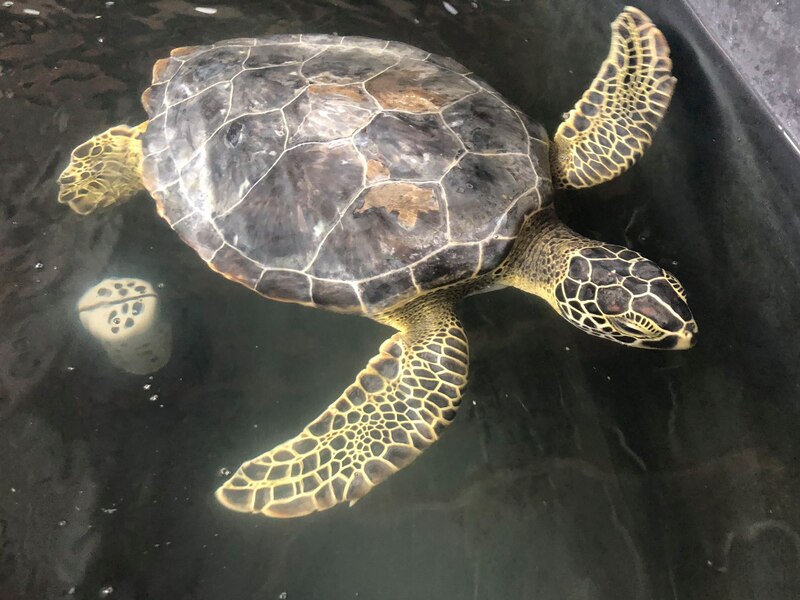 Paddy, a juvenile green sea turtle was released into the Gulf of Mexico on Tuesday, July 17th 2018 promptly at 8:00 am central/9:00 am eastern. The release took place at 9435 West Highway 98 Port St Joe, FL 32456 across from the Lookout Lounge. The sea turtle was rescued on March 19th near the south end of St. Joe Beach by a member of the Gulf County and East Bay Sea Turtle Patrol. The animal had a compression fracture and mild swelling around the left eye. This trauma was from an unknown cause. Paddy was brought to Gulf World Marine Institute for a full wellness check and wound treatment. Initially the sea turtle was thin and not eating on its own. Over time the animal began to successfully forage and dive. The animal gained weight and still had visibility in both eyes. Paddy was medically cleared and deemed releasable by Florida Fish and Wildlife Conservation Commission.